Good thing about Singapore is that you can eat different varieties of food. The food stalls (Hawkers) are selling Chinese, Indian and Malay food. If you're lucky enough to find Filipino food around, share it to us through a comment below. 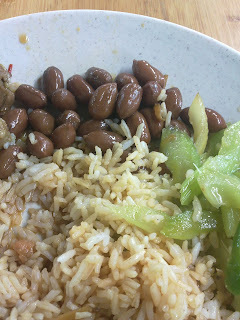 Then one day, in a far far away place called Hawker Station, where everyone are eating, I saw this type of dish. This surprised me for it's only eaten as a snack in Philippines. This is my first time to experience eating it as a dish. At first, I was kind of laughing with my friend but concealing it not to be obvious and may cause an insult to the Uncle vendor. So, I ordered it together with my rice and other vegetables and took a photo. Peanut eaten as a dish. Guys, those are peanuts...I'm serious! I can't believe what I'm eating together with my rice. If I do this in the Philippines, they might laugh at me. Seriously, I never experience eating peanuts with rice. I remembered that there is this Malay food that serves fried peanuts with small dried fish. They call it as "Ikan Bilis". This is served together with roasted chicken with rice as what they call "Chicken Rice". This is my favorite fast food. I call it that way because it's a food that is fast to serve and it's good. How about you, what's your favorite meal in Singapore?